Is there such as thing as “the perfect cup of coffee?” That’s a bit like asking if there’s such a thing as “the perfect haircut.” Different haircuts suit different lifestyles, face shapes and tastes. The team at 18|8 help you figure out your perfect style just like the barista at your local coffee shop helps you discern what type of coffee you consider to be perfect. Simple really. This idea about the perfect hair style or the perfect cup of coffee got us thinking about the multitudes of coffee brewing methods available these days, designed for coffee afficionados who prefer to brew up their own beans as opposed to standing in line at a coffee chain. There’s the Italian Bialetti stovetop moka pot. 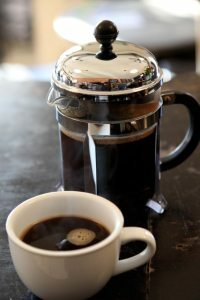 The simple French Press. The luxurious italian expresso machine favored by cafes. The pour-over method favored of late by third wave coffee roasters. Not to mention the siphon, Chemex, and many other space-aged coffee brewing contraptions. There’s also the new cold brewing trend that has picked up steam (or a lack thereof, if you’ll pardon the pun!) in recent years. Plus there is the latte art trend that has become ubiquitous — with lattes, cappuccinos and other frothed milk topped drinks being adorned with pretty leaf or heart-shapes by talented baristas. Here is a breakdown of the various coffee brewing methods available to successful, coffee-loving men. The traditional Italian-style Moka pot is experiencing a bit of a resurgence these days. Coffee enthusiasts like it for many reasons, not least its simplicity, and the adorable gurgling sound it makes as the hot water makes its way from the bottom of the pot up through the finely ground coffee beans and into the top chamber. People are also fans of this simple stovetop device because it is able to produce a pretty exquisite espresso for a lot less than one of those high-end $1,000+ espresso machines. Arguably the simplest and cleanest way to draw out a coffee’s best qualities, the pour-over method is elegant and effortless, certainly far from being prohibitively difficult. For those accustomed to coffee from a drip machine, this method produces a cup of coffee that is familiar, but noticeably more delicate and complex, for true coffee bean connoisseurs. Perhaps not the choice to impress your lady friends, but if simplicity and straightforward cup o’ joe is your thing, this is the coffee method for you. The design of the Chemex has remained completely unchanged (right down to its signature wooden handle and the leather cord around its neck) since 1941, when it was created by a German inventor named Peter Schlumbohm. Schlumbohm’s designs were once characterized as “a synthesis of logic and madness,” and we’re inclined to agree. Equal parts brilliance and common sense, the Chemex remains a staple in the coffee lover’s arsenal. 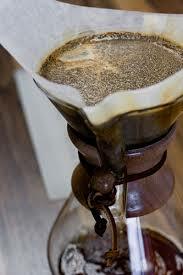 Coffee from a Chemex is very similar to drip coffee, except that there’s more room for error. In order to guarantee the best results, make sure you’ve ground your coffee a bit coarser than in a ceramic dripper (there is, after all, more of it), and that you’ve given extra attention to your rate of pour. When it comes to hair and coffee, we’ll accept nothing less than perfection. But what is perfect for one may not be perfect for another. Keep that in mind when you visit your local 18|8 salon, and come let us help you find your version of perfection. And yes — we will even make you a coffee while we consult with you and then cut and style your hair.